Lock in a great price for St. Martenslane Maastricht – rated 8.5 by recent guests! Clean room and quite, which are important and sufficient for business travelers. Good location as very close to train station. Very comfortable, big bed. Good shower, microwave in the room, extra blankets, spacious room. Staff and the room was big. Bed was comfortable. Very nice staff at the sister hotel where the check in is, great breakfast, spacious rooms, comfortable beds and very interesting decor. We always stay here when we are on a shopping spree from the UK to the mainland. Mainly because of the beds. My husband is 6ft4 and even for him there's room left in the bed when all stretched out. The staff are super friendly and very accommodating. the room was very spacious, the bed was super comfy and massive!!!! the location was perfect, near to the train station. the reception staff were very helpful. the room had air conditioning, amongst other amenities like a microwave and kettle. the bathroom had a bath, so many good things!!! over all a fab stay!!!!! St. Martenslane Maastricht This rating is a reflection of how the property compares to the industry standard when it comes to price, facilities and services available. It's based on a self-evaluation by the property. Use this rating to help choose your stay! This unique and young hotel in the center of Maastricht offers spacious, trendy guest rooms with extra long beds and free Wi-Fi. The St. Martenslane Maastricht is located just 650 feet away from Maastricht central Station. The hotel has an eclectic interior, inspired by the nostalgic and romantic carpentry. Artisan craftsmanship is combined with the high-quality materials and hand-picked design. All spacious rooms have a flat-screen TV, spacious desk, two armchairs and a bathroom with private bath and built-in radio system. The bed linen is made with anti-allergic materials. You can relax in the lobby with a snack or drink from the Food & Beverage Wall. The 24-hour reception (at Townhouse Hotel) is always available for assistance and recommendations of cafés and restaurants nearby. When would you like to stay at St. Martenslane Maastricht? A modern room with flat-screen TV, a sitting area and a coffee machine. They also come with a desk and a bathroom with a bathtub, shower and a toilet. A hairdryer and free toiletries are also provided. Private parking is available at a location nearby (reservation is needed) and costs EUR 22.50 per day. House Rules St. Martenslane Maastricht takes special requests – add in the next step! One child under 2 years is charged EUR 9.50 per person per night in a crib. ATM card Debit card St. Martenslane Maastricht accepts these cards and reserves the right to temporarily hold an amount prior to arrival. St. Martenslane Maastricht accepts these cards and reserves the right to temporarily hold an amount prior to arrival. Please note that check-in takes place at Townhouse Hotel, on Sint Maartenslaan 1-7. Breakfast is also available at the Townhouse Hotel. Hip Hotel St. Martenslane invests in various environmental sustainable solutions. Hip Hotel St. Martenslane asks you for a small contribution, which on your confirmation is referred to as 'Environment Fee'. Receptionist was not enthusiastic at all to attend to very basic questions like where the tourism office was. The room we stayed in was very large, proper beds for all for but it is was not 'gezellig'. Bright lights, tools on the walls. Definately impacted the , otherwise good, experience. The room we stayed in was very large, proper beds for all and nice atmosphere in Townhouse across the street. Beyond the trendy look, attention to details that really matter was unfortunately missing. We got a very wonky and very dusty baby bed. The baby chair was missing a piece. The elevator didn’t work the first day. The light switches in the headboard, meaning that if one seats in bed, one leans against the switches. The middle window was dirty. All in all, it was more hipstery deco than practicality. I’m not sure travelers care about seeing Smeg decorative appliances, but they do care about where the plugs are ;) the place could be awesome with some small improvements! The location is perfect. The place looks very good. The staff was trying to be friendly. The lift is in old style, and I haven't used one like that in many years... In the bathroom, the mirror is a bit far from you, a little less comfortable to shave. The hotel is in good location, next to the train station. It is about 15 minutes of nice walk to the city centre. The staff is friendly and helpful, breakfast was good, and the hotel is very clean. Also I liked the fact that there are some free food and drinks in the lobby. Also, the room has a small kitchen with a microwave, a kettle and some kitchenware, and that was also a comfortable and useful thing. Location is good, very close to the train station. Spacious room, clean and comfortable. The hotel is is located in the heart of the Wyck district, where you will find supermarkets, plenty of restaurants (in all price ranges), galleries and (art) shops. 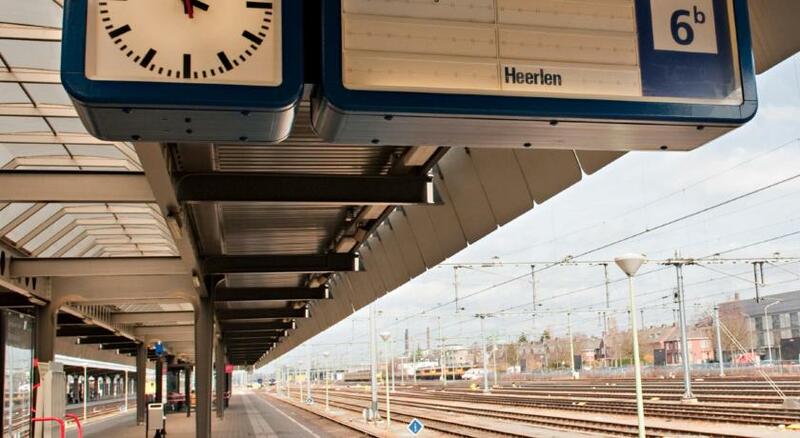 Great location with the Maastricht central train- and bus station just around the corner. The city center of Maastricht is within walkable distance, it will bring you across the river Maas with some amazing views. Very convenient was the affordable car parking (13 euros per 24 hours) at the Q-Park opposite the hotel. LBG Hotels is always a guarantee for unique and creative hotel concepts and St. Martenslane is no exception. The hotel is well designed and themed around ancient and modern craftsmanship. Quite interesting and educational at the same time, take your time to explore the hotel itself. The room was spacious, the bed was king-size and the bathroom was clean and it offers all the things you need for a pleasant stay whether you are travelling for business or leisure. The small kitchenette with a microwave made the room complete. A nice plus was the warm cup of soup at check-in and the complimentary fresh fruits in the lobby. And last but not least the the reception staff were very nice and friendly! No teaspoons! But hardly much to complain about! Stylish well furnished rooms with lovely quirky artefacts to enjoy looking at. Great beds!